Trial results for promising drugs may help the company turn the corner, but declining sales remain a problem. Fierce competition in the hepatitis C market has caused Gilead Sciences' (NASDAQ:GILD) sales and share price to slide, but the dividend-paying company remains profitable and there are catalysts on the horizon that could reignite interest. Is now a good time to add this biotech behemoth to portfolios? Gilead Sciences has been selling widely used HIV drugs for over a decade, but its recent woes stem from declining demand for its hepatitis C drugs. The company was the first drugmaker to develop oral medicines that provide functional cures for the liver disease. However, other drugmakers have rolled out their own treatments, sparking a price war that's taken a toll on Gilead Sciences' financial results. 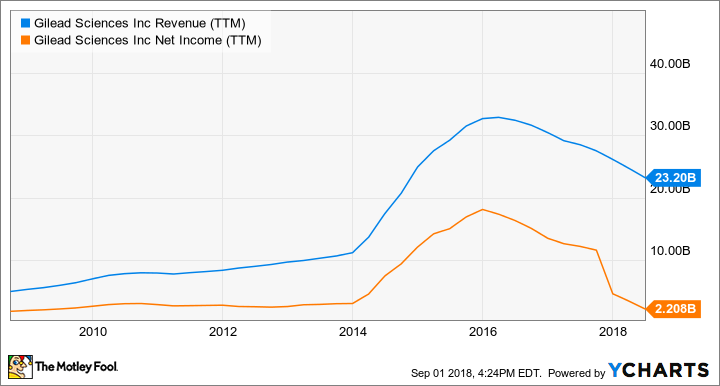 The increased competition has resulted in trailing-12-month sales slipping from over $30 billion to about $23 billion since 2015 and, unsurprisingly, the fall-off in revenue has resulted in a steep decline in net income. In Q2 2018, Gilead Sciences' earnings per share (EPS) totaled $1.91, down significantly from $2.56 in Q2 2017 and $3.08 in Q2 2016. Over the past 12 months, its net income has been only $2.2 billion, down from over $15 billion at its peak. GILD Revenue (TTM) data by YCharts. The revenue and profit decline don't appear to be over, either. The company's hepatitis C drug sales fell 65% year over year in Q2, yet they still totaled $1 billion. It's likely going to be unable to maintain that $4 billion run rate in hepatitis C sales going forward because AbbVie's (NYSE:ABBV) latest drug in the indication, Mavyret, continues gaining steam. In Q2, AbbVie's hepatitis C revenue grew more than 100% to nearly $1 billion. In order for Gilead Sciences to regain investors' confidence, it's going to need to launch new drugs with billion-dollar blockbuster potential. Fortunately, it has two research and development programs advancing toward the finish line that could produce top sellers and data from trials for those programs is fast approaching. First up will be results from the phase 3 study of filgotinib in rheumatoid arthritis. Gilead Sciences acquired the rights to filgotinib from Galapagos (NASDAQ:GLPG) in 2015 and the two companies are currently evaluating it across a range of automimmune diseases. So far, filgotinib has shown promise in rheumatoid arthritis, ulcerative colitis, Crohn's disease, and psoriatic arthritis. There are three phase 3 rheumatoid arthritis trials that are fully enrolled and results from its first phase 3 study, which is evaluating its use alongside conventional disease-modifying antirheumatic drugs (DMARDs) who inadequately respond to biologics, is expected later this year. Those results will be followed up by data from a trial evaluating it head-to-head against the commonly used methotrexate and the over-$18 billion biologic Humira early in 2019. In addition to filgotinib, the company's research is also progressing in nonalcoholic steatohepatitis, a silent liver disease that's quickly becoming a major cause of liver transplant. Gilead Sciences has various trials in NASH ongoing, but the first late-stage data that could support a Food and Drug Administration filing for approval will come from its study of selonsertib, an ASK1 inhibitor being evaluated in patients with F3 and F4 cirrhosis. Results are expected in the first half of next year, and if they're positive, a filing could occur in the middle of 2019. Rheumatoid arthritis and NASH impact millions of people and, thus, they're both potentially huge markets that could kick-start Gilead Sciences' financials. However, Gilead Sciences isn't the only company that's researching new ways to tackle autoimmune disease or liver disease and competitors could outmaneuver it. Nevertheless, risk-tolerant investors might want to tuck some shares of Gilead Sciences into portfolios ahead of these important data readouts. There's no guarantee that filgotinib and selonsertib will succeed, but if they do, Gilead Sciences shares could rally sharply because they're arguably trading at a discount valuation. Its 4.5 price-to-book ratio and 4.3 price-to-sales ratio are the lowest in over five years, and its forward price-to-earnings ratio of 11.5 isn't very high, either. If earnings continue to fall, then the P/E ratio could get less attractive, but I think the company's financials could level off next year, and if these drugs pan out, that could position it to return to growth in 2020. In such a scenario, Gilead Sciences' investors could end up being nicely rewarded for picking up some shares now.